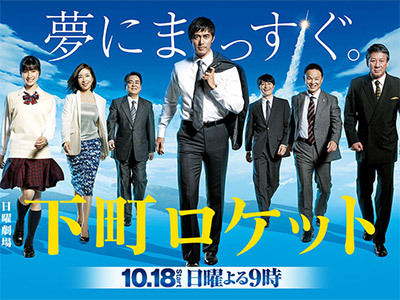 TBS presents the drama version of "Downtown Rocket" by Jun Ikeido starring Hiroshi Abe. A man who gives up his career as a researcher to succeed his father's manufacturing factory strives with his workers to overcome the troubles and pursue their passion in manufacturing. Though Kohei Tsukuda (Abe) quits research at the Space Science Development Agency to suceed Tsukuda Manufacturing, he cannot leave behind his passion for developing rocket. The cost for developing rocket engine has put Kohei's company in serious financial trouble. While he scrambles for funds, their rival company - Nakashima Industrial - sues Tsukuda Manufacturing for patent infringement. The company's reputation soon goes down and banks refuse to finance them, but then one of the leading companies in Japan, Teikoku Heavy Industries, offers to buy a Tsukuda's patent for 2 billion yen. Although the company is heavily in debt and desperately needs the cash, the patent is what the engineers put their dreams. Kohei - a president who is responsible for the living of his workers - faces a difficult judgement to make. After the great hit of Hanzawa Naoki, I wanted to watch another dorama based on a novel of Jun Ikeido, as Hanzawa is. However, despite the fact that would be considered as a work belonging to the new Oshigoto genre, that Ikeido popularized, it doesn't have the intensity that Hanzawa Naoki dorama had. First of all Abe Hiroshi is Abe Hiroshi as always, he doesn't add any special feature here, his way of acting is the same that most of the doramas he has taken part. I am not saying he isn't a good actor, for me is one of the best ever, but here I expected to see another thing. The rest of the cast act well, but they aren't so charismatic. The story is interesting, but it could be almost the same as many of the Oshigoto doramas previous to Hanzawa Naoki, like Hero (2001), that is, interesting but not unforgettable. 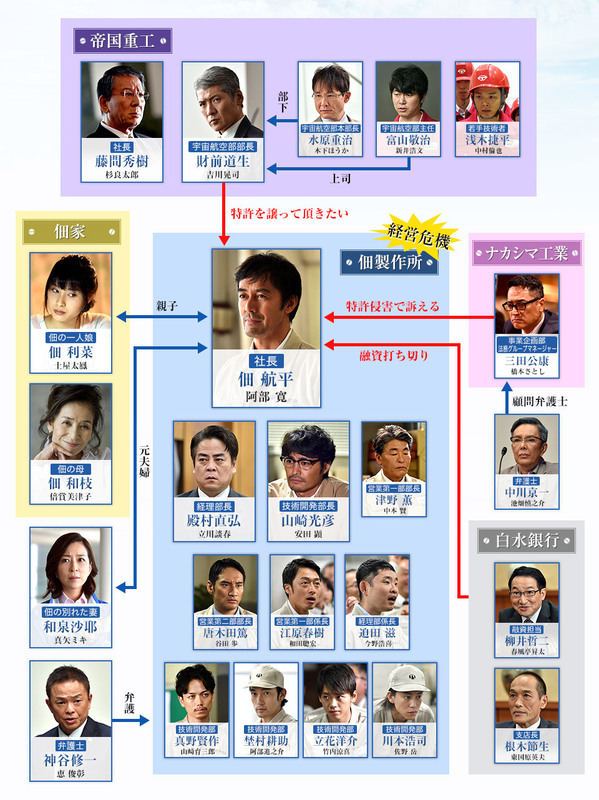 The difference with the rest would be that here is so visible the Ikeido's influence, like an structure of the show, a development of the story, a lot of business details or relative to them, and some turn of events, seeing before in Hanzawa dorama. Briefly, if you watched Hanzawa Naoki you will recognize similarities with it here, but don't expect the same level of quality and impact. Written by the same guy that wrote "Naoki Hanzawa" and "Roosevelt Game". Same scenario, big guy vs. little guy, lots of betrayal and backstabbing. Also lots of overacting, screaming, and pounding on tables. If you liked the other two, you'll like this one. If not, then you won't. A very strange business series. Who can produce the best valves!!! Very interesting drama with a resplendent Abe Hiroshi!